There are quite a number of handheld espresso makers, mainly targeted at campers, backpackers, and ultra light road warriors. The Nomad by UniTerra is similar in that it is hand-operated and requires no electricity, but it comes in a larger though still portable form factor. It seems more appropriate for a picnic, road trip, vacation home, dorm, office, or even your primary residence. 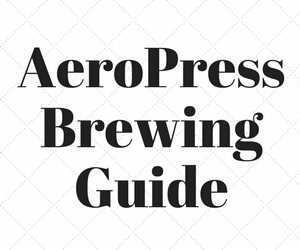 The question with all hand-powered espresso makers remains the same: How good is the espresso compared to their electric-powered counterparts? Read on to find out. The Nomad is an oddly beautiful looking device with strange geometric angles and lines, and yet it looks like a small piece of art that anyone would be proud to display. Mine is a gorgeous Cobalt Blue with matte silver accents. It is also available in a Luminescent Green color. 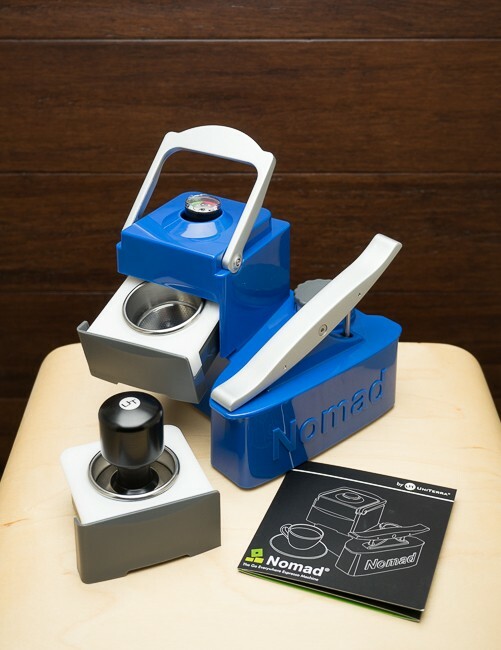 The Nomad is made up of the main base unit and attached pump lever, built-in water tank and removable cap, filter assembly (coffee drawer, brewbox, and basket). 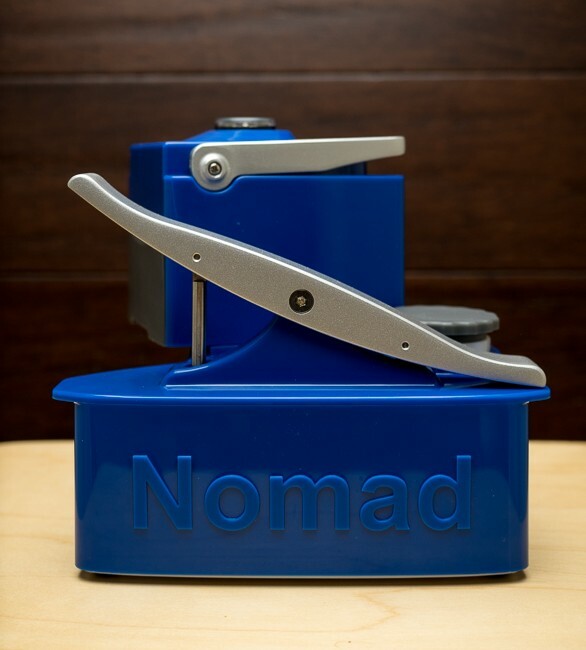 Nomad also includes very detailed printed instructions, and a tamper. The build quality is simply excellent. 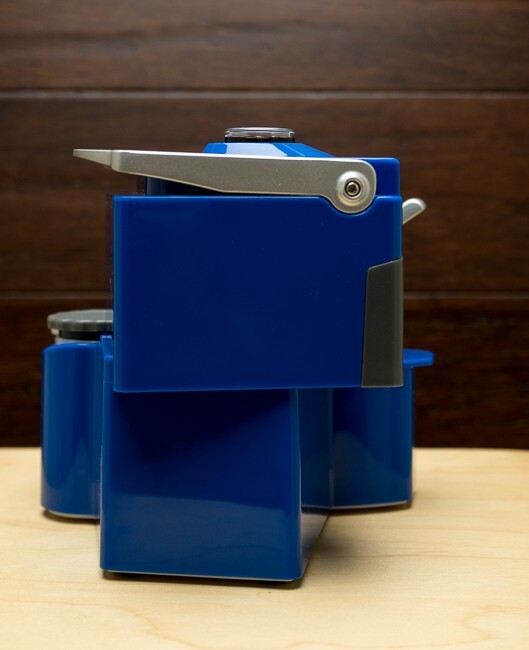 The fit and finish are probably the best in just about any coffee product I have reviewed over the years, including the $2000+ prosumer Italian espresso machines I have purchased on my own. The unit is designed in the USA, and made in Taiwan. 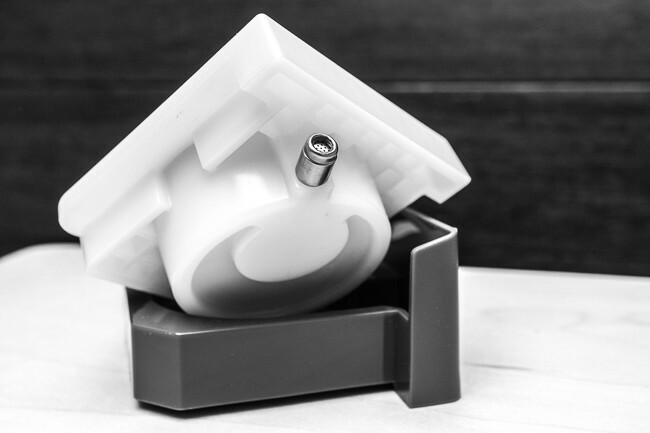 One of the unique features of the Nomad Espresso Machine is what they call the True Crema Valve, or TCV. 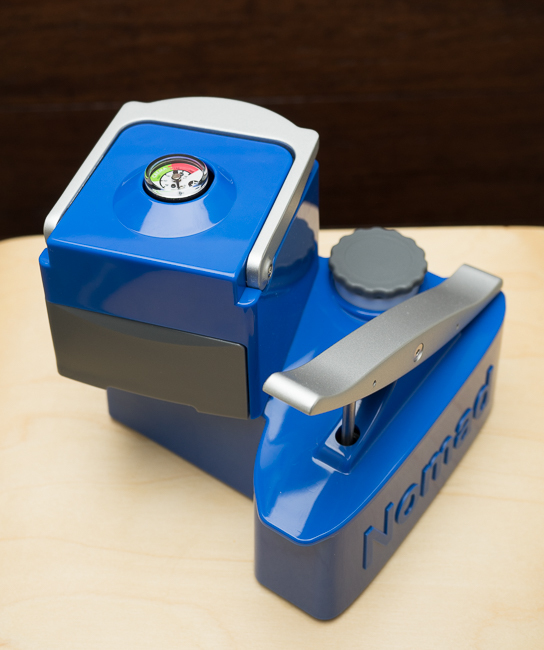 It claims to compensate for tamping and grind level variations. 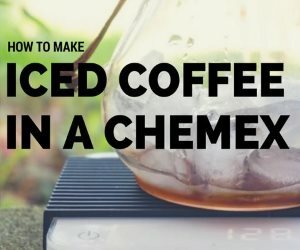 They even say that you can use pre-ground coffee from the store or ground beans from a whirly blade grinder, and still get excellent results. 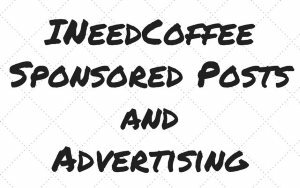 The TCV can be removed, which then means the ground and tamp become more critical, just like an unforgiving espresso machine. I did not experiment with a poor grind nor did I remove the TCV. I might do this in the future just to compare and understand the capabilities and limitations. 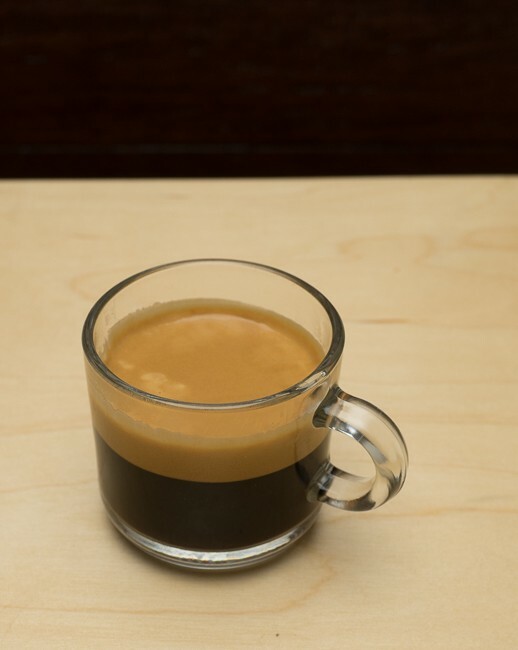 Making a shot of espresso is relatively straightforward. It starts with filling the water reservoir with about 7oz (200cc) of boiling water, and filling the basket with finely ground coffee and tamping. 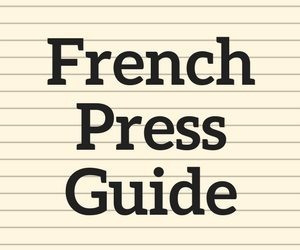 It is then recommended to pump about 12 times for pre-infusion and then wait a few seconds. 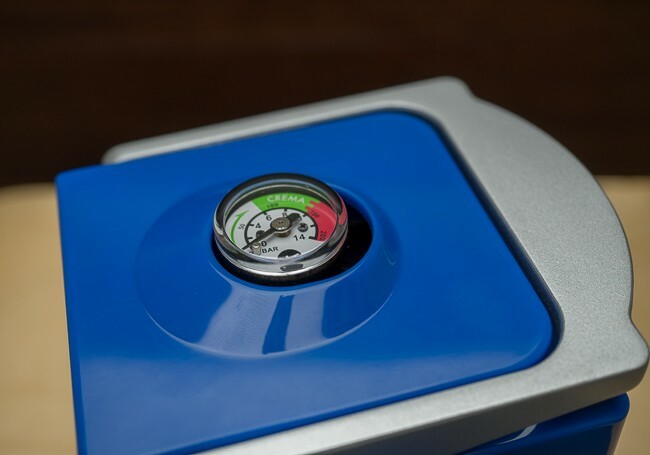 Then you pump until you are in the green zone indicated on the pressure gauge. Now you just pump the seesaw lever fast or slow enough to keep it in the correct range until your espresso is done. I did my experimentation with a Brazil, about 5 days off the roast. At first I used a grind level that I had setup for my Izzo Alex Duetto III, and didn’t fill the basket fully. The crema was good, and the flavor was nice. I then adjusted the grind finer, and filled the basket to the max. The result was even more crema and flavor. It was very close to the Alex, and in some ways was smoother. I was really impressed with the flavor, and ease of repeatability. First try with coarser grind and less coffee. Results were good. Second try with a finer grind and more coffee. Results were excellent. Because there are several pieces as part of the filter assembly, the cleanup really requires running water. So if you needed to serve several espressos out in the field, I would recommend extra filter assemblies, also available for purchase separately. With all products, there are always a few things that could use improvement. All of these are things I would like to see improved on V2, but none are showstoppers that would keep me from purchasing the current generation of the Nomad. I found that the fill spout was a placed a little low, which made it awkward to fill, so I would like to see a slightly higher fill spout. There are times when you end up using your palms to maintain the proper pressure on the seesaw lever, and it would be nice to see a little more comfortable shape at the ends. My Illy cappuccino cup barely fits under the machine, actually lifting the machine up just a bit. I would like to see more clearance for taller cups. At just under $300, the Nomad is by no means inexpensive. 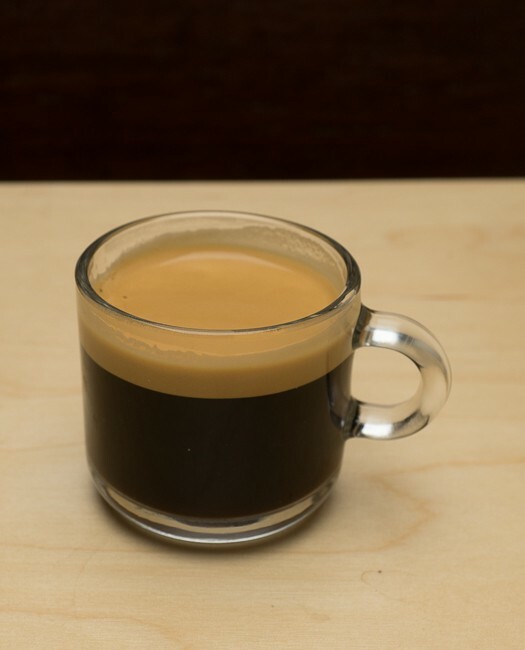 However, I would say it’s flavor and crema rivals more expensive electric powered espresso machines, so in that sense I consider it a bargain. Electric powered espresso machines can also use a lot of electricity, so this could go a long way toward lowering your electricity bill and potentially your carbon footprint. You also have something portable, which greatly increases versatility. Add to that a very strong aesthetic quality, and just about anyone would be proud to leave this out on the kitchen counter or office desk. 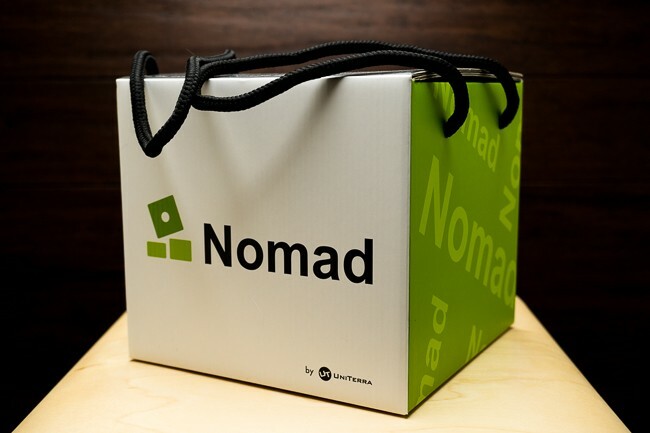 The Nomad is highly recommended.